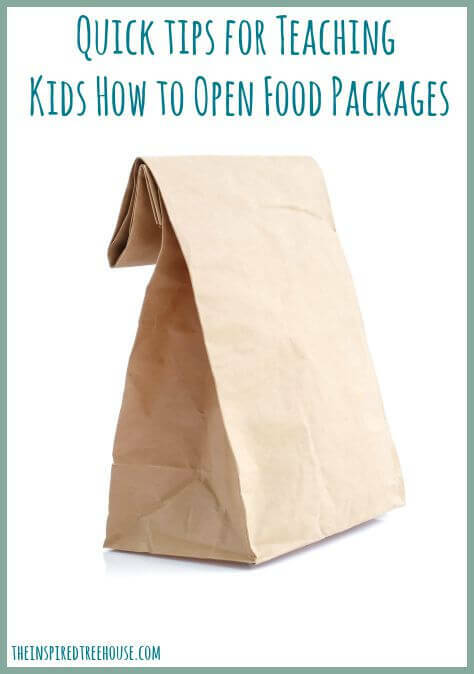 Check out a few of our favorite ideas for helping kids learn to open food packages! All it takes is some strength, coordination, and a little bit of perseverance! I’m a “lunch duty mom” at my daughter’s elementary school and every time I’m there, I see how many children struggle to open the packages in their lunches. They’ll work at it for a second and then give up, shooting their hand into the air to ask for help. Milk cartons, yogurt cups, snack bags, bananas…all of them take some serious fine motor skills, motor planning, and strength to open! 1 || Tearing paper: The movement of pinching, moving one hand forward as the other moves back, and working again the resistance of paper are all excellent precursors to tearing open those packages and cartons! 2 || Breaking sticks: Go for a little walk in the backyard and find some sticks! Have the child hold a stick upright and break off the tip, stabilizing with one hand and applying force with the other. A great precursor to peeling a banana! 3 || Stretching balloons: Give kids a non inflated balloon and let them stretch it. Not only is this a fantastic fidget toy (great for keeping little hands busy at a restaurant), but it also requires the same motion as pulling open those bags of chips or pretzels! 4 || Peeling tape: Stick several small pieces of tape to the table and have kids try to pinch, grasp, and pull them off! 5 || Plastic container match-up game: Place several different plastic lunch containers on the table. Remove the lids of the containers and mix them up, placing them on the table near the containers. See if the child can find the matching lids and twist or snap them back on the correct containers. 6 || Lego or Duplo blocks – Both awesome for developing grasp strength needed for pulling, twisting, and pinching those lunch and snack containers! 7 || Velcro – Pulling against heavy duty Velcro is another great hand strengthener. Try adapting books using Velcro, making file folder games, or making other fun velcro fine motor tasks! 8 || Rubber Bands – As with ballons, kids can stretch and pull against the resistance of the bands to promote strength in their hands. Or try creating masterpieces on a geoboard! 9 || Squigz – These cool little gadgets are fun and colorful and they make a great popping noise when you pull them off of a surface or off of each other. More great hand strengthening and bilateral coordination fun! Check out more fun hand strengthening activities here! And don’t forget to follow us on Pinterest to see our favorite activities for kids and to find other great resources about child development from around the web! Follow The Inspired Treehouse’s board The Inspired Treehouse on Pinterest. Looking for more tips and information about child development? Pam Braley has been an occupational therapist since 1997 and has worked in several environments including pediatric inpatient and outpatient rehabilitation, step down NICU, and currently school based for the past 8 years. She is a mother of two beautiful children, Jack (7) and Ella (5). 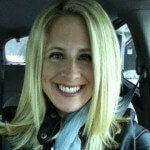 Pam enjoys cooking, reading a good book, exercising including walks, yoga, and training with friends. This quote has traveled with Pam to each desk she has claimed while being an OT and helps her stay focused both in her career and as a mom. Thank you, Katie! Let us know how they work!!! You could also teach them to pinch open their bananas from the bottom end. It’s much easier and is how monkeys actually open them! Thank you for this information, I am a nanny/tutor for children with fine motor issues and in school to become an OTA : ) so will definitely use these techniques and sign up for more! Thanks so much for stopping by! I’m so glad you were able to find some useful ideas in this post! If you sign up for our newsletter you’ll get a weekly email with our posts and other great ideas like these that we find around the web! Take care!